The new XRotor 15A does not support signals with refresh rate up to 621Hz like the 10A version. The new XRotor 15A support “OneShot” and “DEO” (which is like “Damped light” on BLHeli or comp_pwm and motor_brake on SimonK). 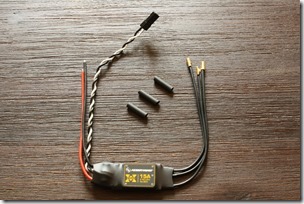 The old 10A ESC does not support these functions. 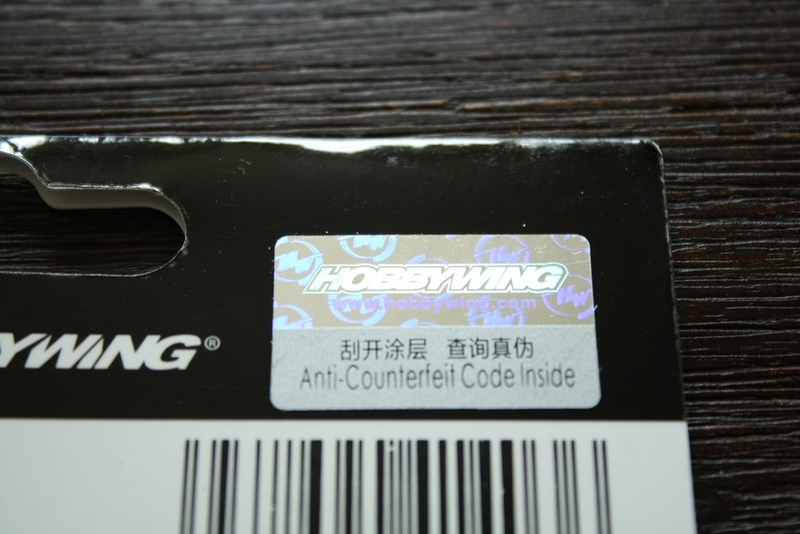 HobbyWing made some tests and claim that these new ESCs have better efficiency and lower temperature. 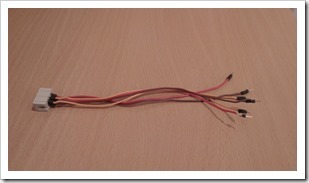 So I decided to give these ESC a try and ordered 4pieces for the acro quad. 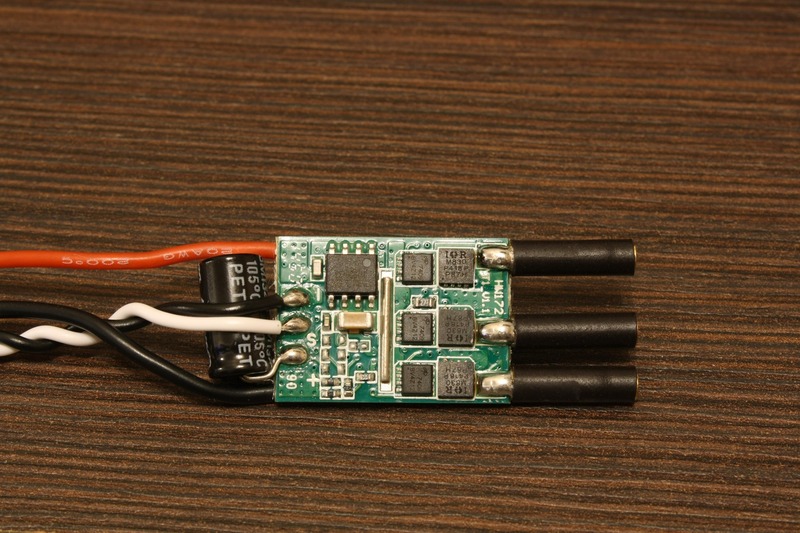 The ESCs came extreme quickly from Hong Kong to Germany, only 10 days. Before I mount them on the quadcopter I wanted to know what’s inside under the heat shrink, so opened one and made some photos. 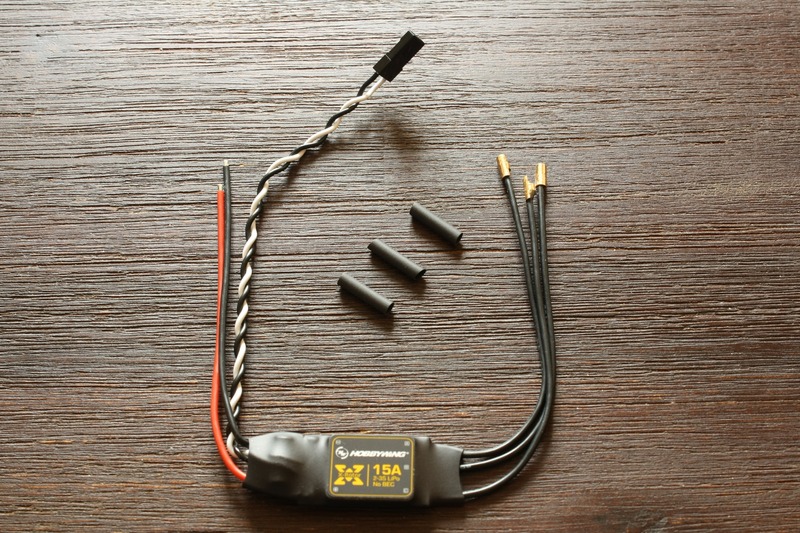 The ESCs are a bit bigger and heavier than the XRotor 10A. Unlike them these have longer motor cables and some other type of gold connectors. On the backside you can see the IRFH8318 MOSFETs. 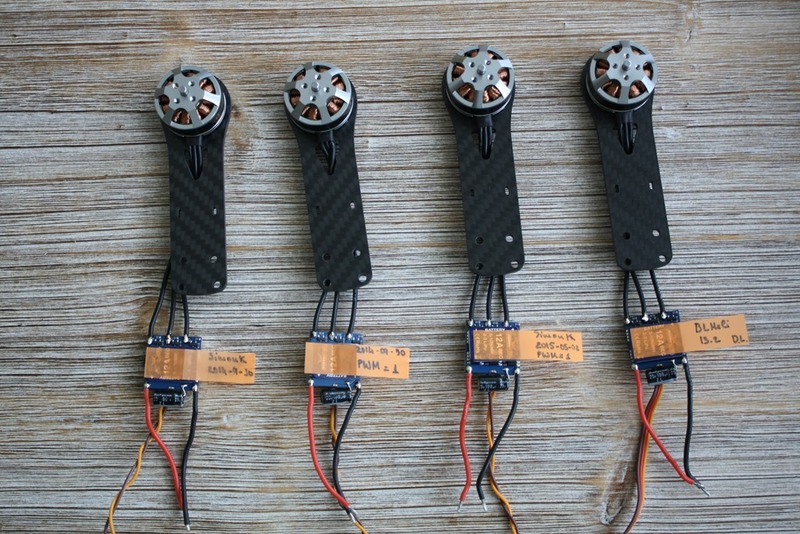 These are rated to 30V, so maybe flying on 4S could be possible. Here you can find the datasheet. 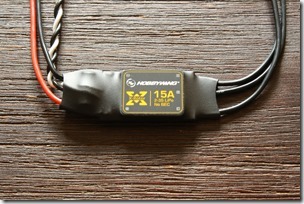 On the front side the XRotor 15A is completely different from the XRotor 10A. I will check and ask what the elements exactly are, as I cant find any information right now. MPSF34 / MP6530 – Brushless DC Motor Pre-Driver by Monolithic Power Systems (Max 60V). HW503 / 515AB – I can’t find any information about this chip. (Thanks to QuadMcFly from RCGroups, who corrected me, that it is not HH503). 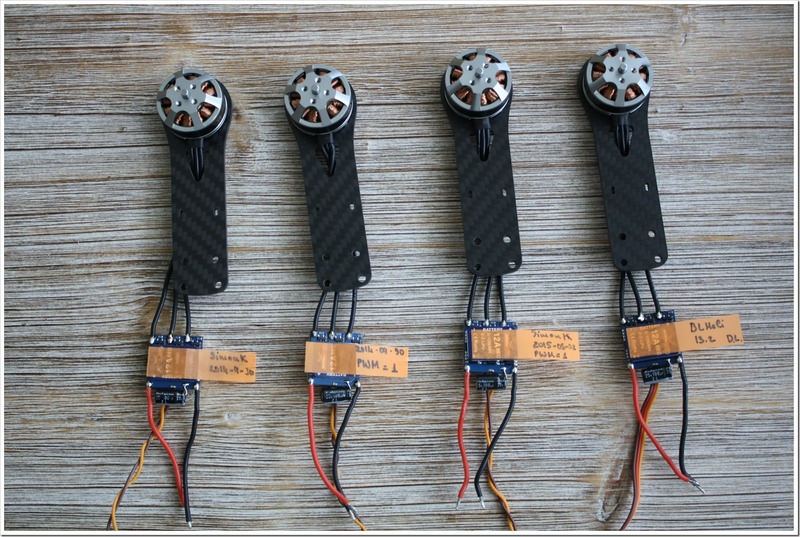 I will update the article as soon as I mount these on my SG Acro v1.1 quadcopter with the T-Motor MN2206 and give them a try. 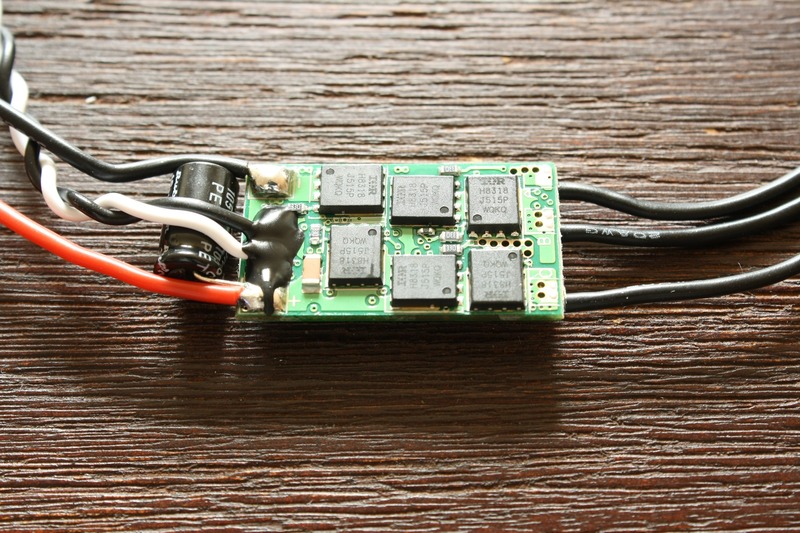 Update 30.09.2015: The ESCs are already mounted on my acro quadcopter and they perform very well. OneShot is activated and I have no sync issues with the T-Motor MN2206. Active breaking is about the same as on HK BlueSeries 12A with BLHeli, but in my opinion not so great as SimonK with comp_pwm and motor_brake enabled. 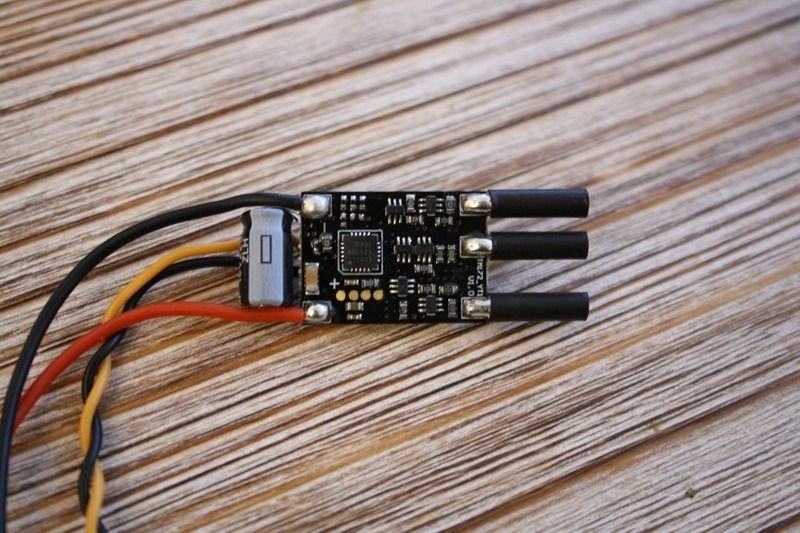 The ESCs are rated for max 3S, but I have tested them successfully on 4S with no problems. They don’t get warm and I haven’t experienced sync issues. 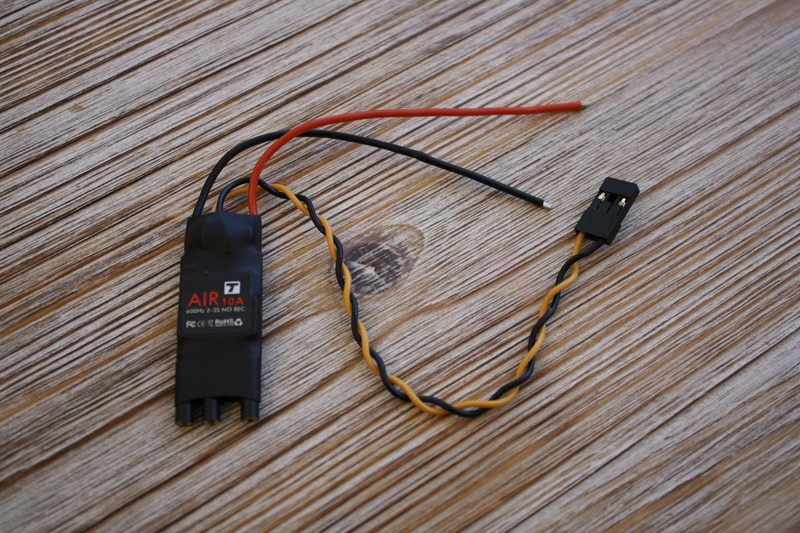 Here a picture of my SG Acro v1.1 with the ESCs heatshrinked directly on the arms. 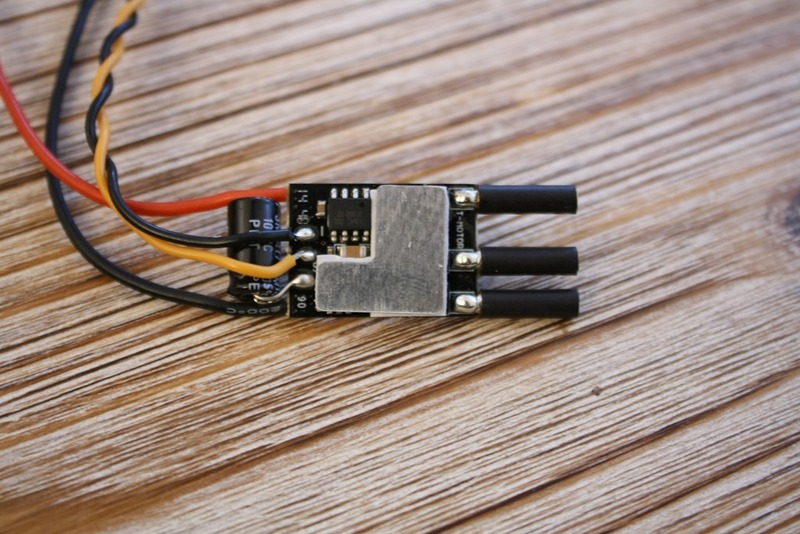 I can’t tell for sure if these ESCs have higher efficiency than BLHeli or SimonK ESCs, as this is hard to test without a power meter. If this helps you, I got about 14min mixed flight time (Quad weight is 270g without the 4S 1300mAh battery; props are 6” carbon). They came well packaged, but with manual in Chinese. This is actually normal as I ordered the Asia-Version, because it was cheaper. If I wish, I can always download the English manual. 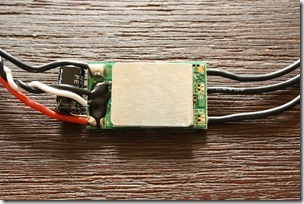 The ESC is really small: 36.5mm x 16.4mm x 4.1mm. The weight is 6.5g with 2mm connectors already soldered. So it is really easy to connect to my T-Motor MN2206 or MN1804 motors. 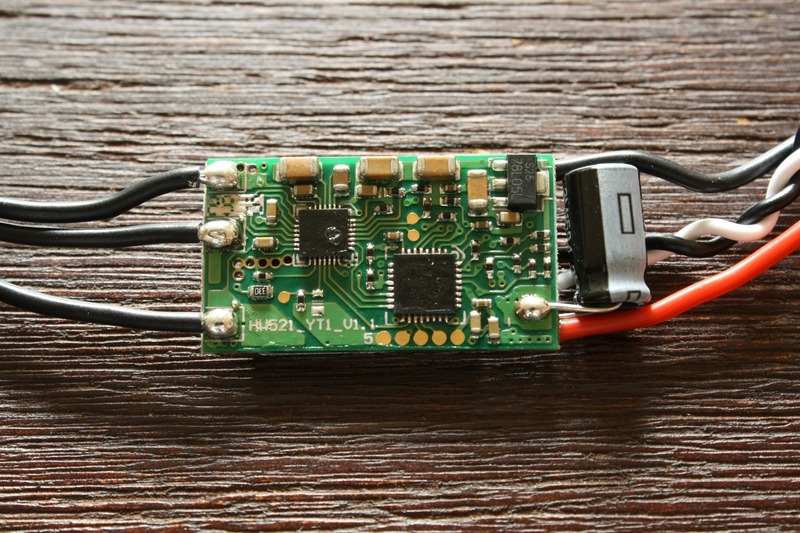 It is important to know, that the ESC does not have any BEC, so you cant power the flight controller directly from the ESC. 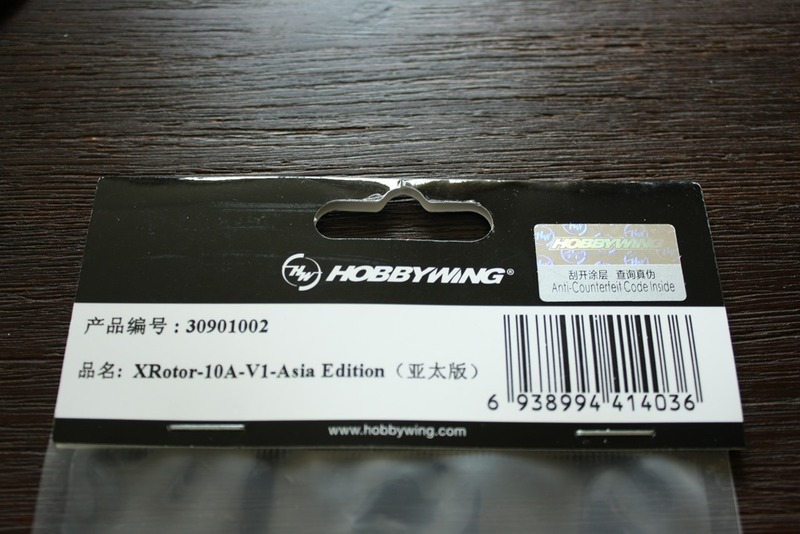 I decided to remove the heat shrink on one of the ESCs, to check what is inside and as expected, these ESCs are exactly the same as the T-Motor Air 10A. I have already tested one T-Motor Air 10A (compared with one HK BlueSeries 12A flashed with the newest SimonK and comp_pwm enabled) and it performed great. I am not absolutely 100% sure if the XRotor 10A have the same firmware as the T-Motor Air 10A, but it is probably the case. 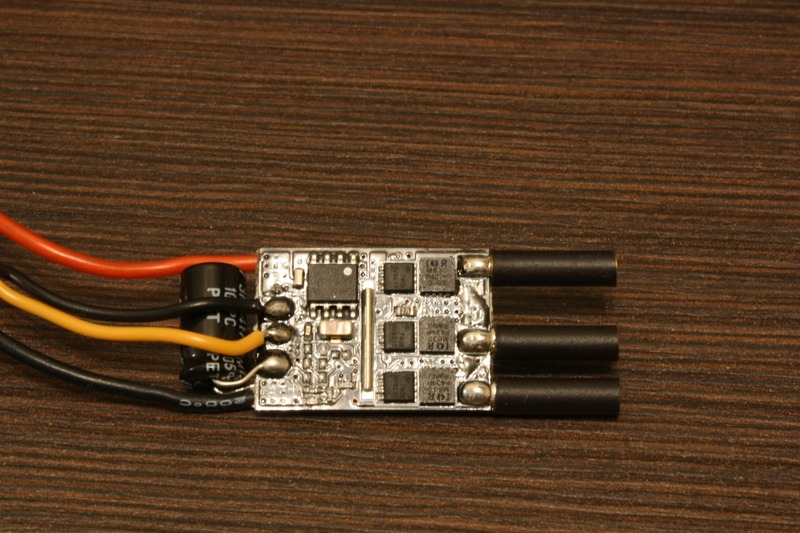 Both ESCs are labeled as 2-3S, but I will give it a try on a 4S configuration and see if it will burn. 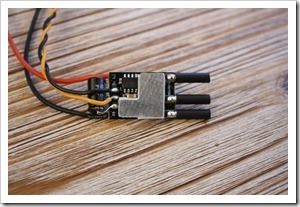 If you already tested these ESCs on your multicopter, I would love to know about your flight experience with them. Both SimonK and BLHeli firmwares are getting updates, new features and I was wondering which of these is better for my quadcopter. Since I started with the multirotors I was using the SimonK firmware and I am still happy with it. 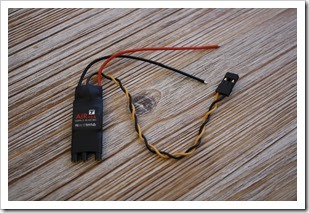 I also will test one T-Motor 10A Air ESC, which has its own firmware. There is a significant difference between the SimonK firmware with enabled and disabled comp_pwm feature. The motor on the ESC without the comp_pwm stops probably a second later. 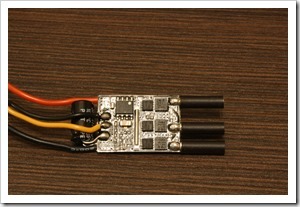 On the other side the ESC with the BLHeli 13.2 and damped light stops even faster than the one with SimonK and comp_pwm. So 1-0 for BLHeli over SimonK. I was corrected on the RCGroups forum, that I didn’t enable the “MOTOR_BRAKE” feature on SimonK, so the comparison is not exactly right. I will test that too and update this article. Then I decided to compare the BLHeli 13.2 and the SimonK 2015-04-19, as both support the “OneShot125”. Well here I found the SimonK better and smoother than the BLHeli ESC. 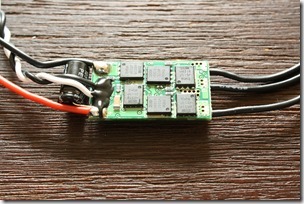 The motor on the SimonK ESC was much quieter. 1-1 SimonK vs. BLHeli. Note: I used the standard settings on BLHeli, so there could be an option to change, that will make it perform better. 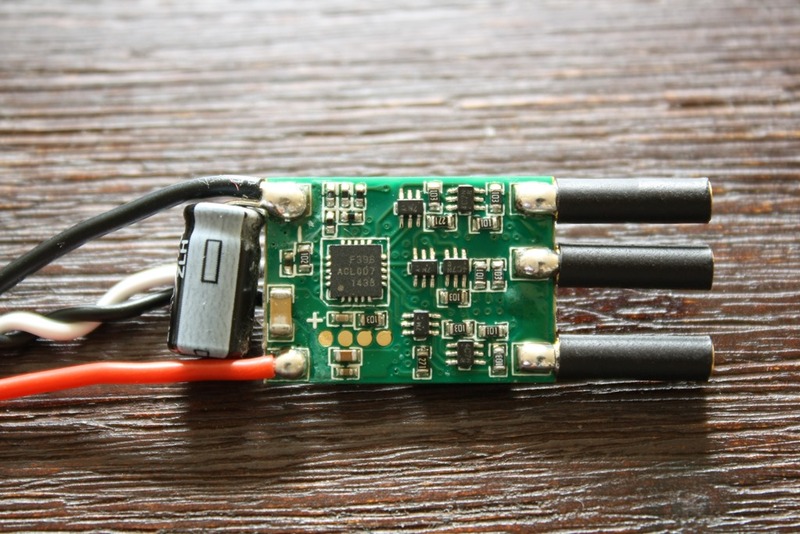 The T-Motor 12A Air ESC with its stock firmware does not have a feature like comp_pwm and damped light, so it behaved like the normal SimonK firmware. The motor was very responsive and its sound was also very quite. It is a bit subjective, but I think it performs like the SimonK with the “OneShot125” or even better. 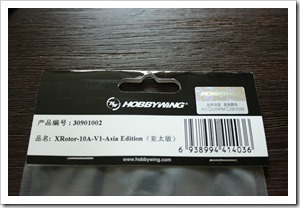 It is also a bit lighter (7.3g) and smaller than the HK BlueSeries 12A ESC. 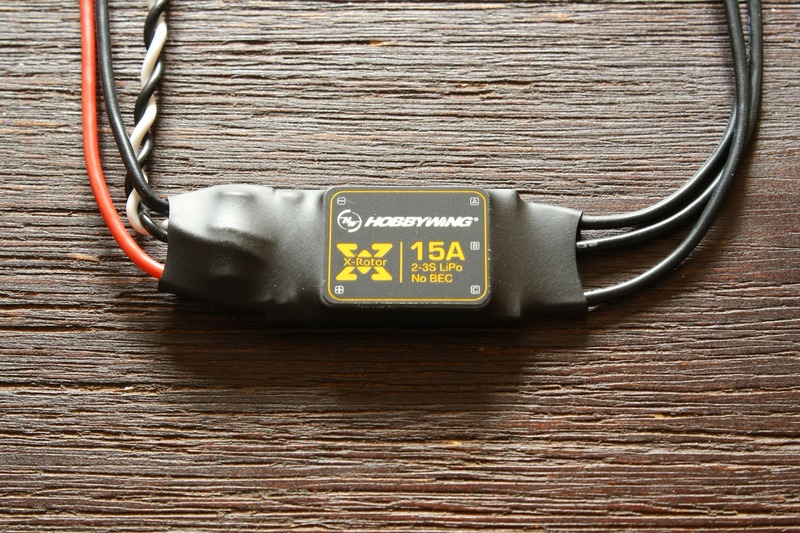 Please note that I only tested one type of ESC (HK BlueSeries 12A) and one type of motor (T-Motor MN2206 2000kv) on a 3S battery. The results can be different on other configurations. Conclusion: The damped light on the BLHeli is a bit better (*to be updated) than the comp_pwm on SimonK, but the last one performs in my opinion much better in “OneShot125” mode. 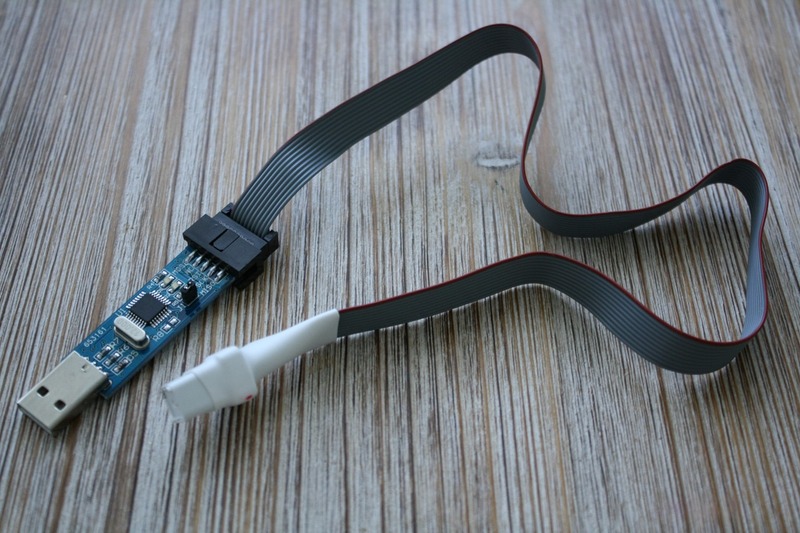 In this article I will show you how to flash the SimonK firmware with your Arduino through the ESC´s signal wire without removing the shrink tube and using an ISP Programmer. 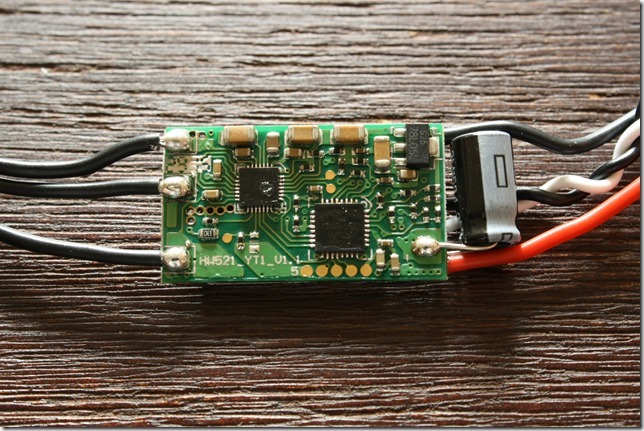 Important: to flash the firmware through the signal wire, the bootloader of the ESC must be enabled. This is the case if you have bought a SimonK preflashed ESC (like the Afro Series ESC) or you have already flashed the ESC with an ISP Programmer and have enabled the bootloader by yourself. First we need to flash the ArduinoUSBLinker code on the Arduino. If you want to upload it through the Arduino Software, download the source code from github. Open the ArduinoUSBLinker.ino file in the Arduino Software, select the right COM port and upload it to the Arduino board. 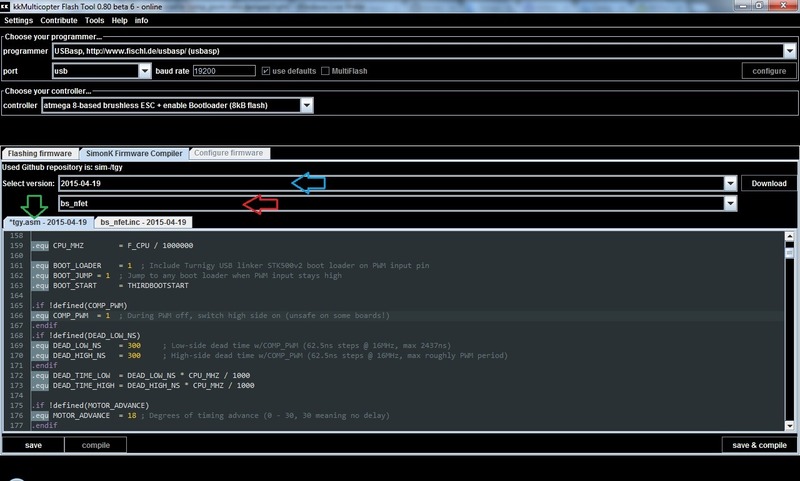 You can also use the KKmulticopter Flash Tool for making the ArduinoUSBLinker. 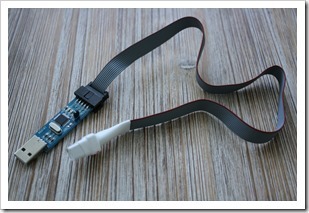 Go to the “Tools”-menu and click on “Upload Arduino USB Linker” and select your Arduino board. Wait for the message, that you should connect the Arduino to the PC. Then plug it in and click “Ok”. The Arduino should be detected by the system. If the flashing is successful, the Arduino board is ready. 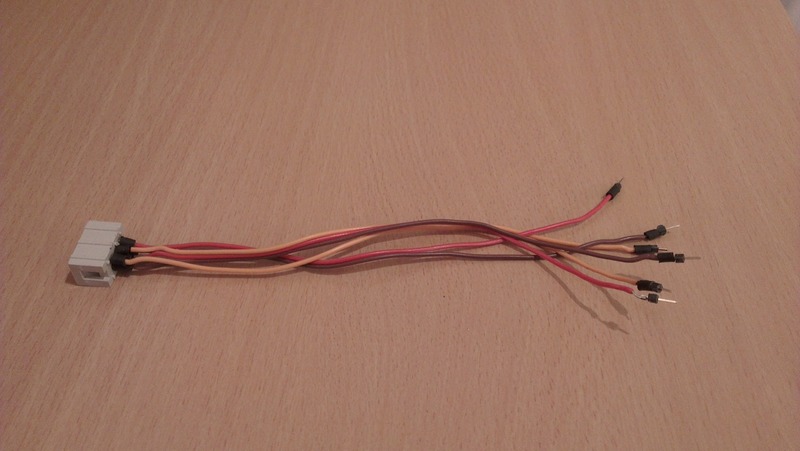 Connect the orange wire (signal wire) from the ESC to Digital Pin2 on the Arduino and the brown wire (ground) to the GND Pin on the Arduino. 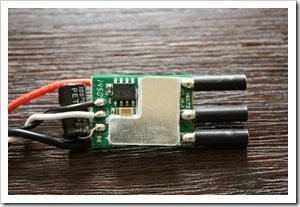 Connect the ESC to an external power. Flashing the SimonK firmware through the signal wire is almost like flashing the firmware with an ISP Programmer. The only difference is, you choose as an Programmer the ArduinoUSBLinker. 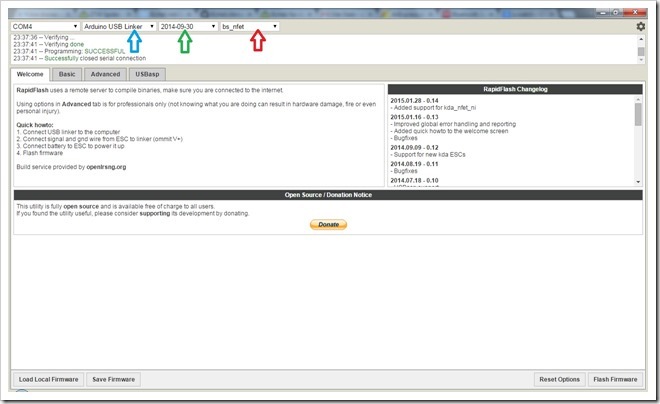 Choose the right controller (without bootloader, as it is already enabled), the right firmware and firmware version and click on the green button on the right to flash it. 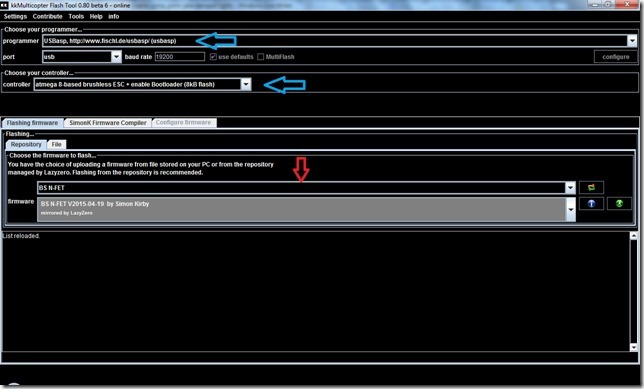 If you wish to enable the comp_pwm (aka damped light) function, check how to do it in the article mentioned above. You can also flash the SimonK firmware using the RapidFlash App for Google Chrome. It looks very similar to the Baseflight/Cleanflight Configurator for the Naze32/CC3D boards. Select the Programmer, COM Port, Firmware and the Firmware version and click flash. On the ”Advanced”-Tab you can enable the comp_pwm function much easier than with KKmulticopter Flash Tool. If you have any problems, feel free to comment. 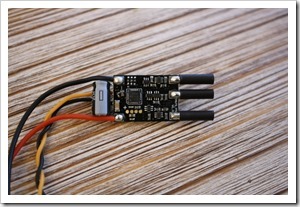 Many of the ESCs on the market have their own firmware and are not optimized for using in multicopters. The solution to this problem is to flash a special firmware on these. Note: Not all of the ESCs can be flashed with these firmwares. Check this list to see which ESCs are supported. Two of the most used firmwares are the SimonK and BLHeli. Which one is better is hardly to say, especially when using different type of motors. Here I will show you, how to flash the SimonK firmware on an HK BlueSeries 12a ESC and more importantly how to enable the comp_pwm function on it. But what is comp_pwm? It is not exact the same thing as damped light on BLHeli, but it performs a bit like an ESC with damped light function enabled. 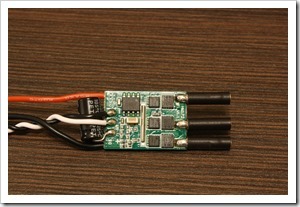 On the KISS ESCs it is called active freewheeling. 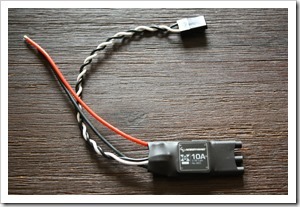 It switches the passive MOSFET on your ESC “ON” during the freewheeling phases and by this reducing the power loss. If you want to learn more about PWM and active freewheeling, watch this video here. Back to damped light or regenerative braking: what does it do? When you reduce the throttle the motor does not stop immediately. 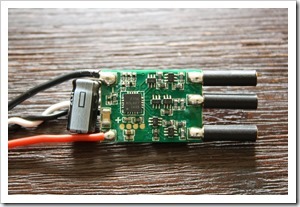 When comp_pwm is enabled, it also helps the ESC to stop the motor faster. 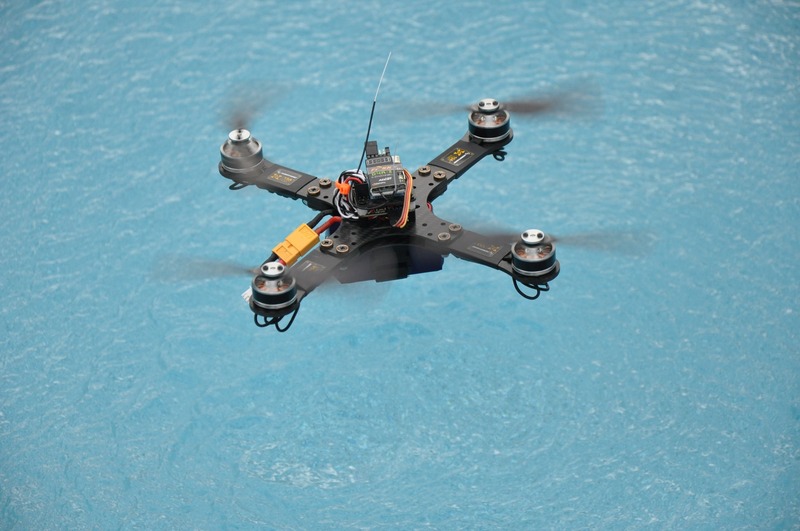 This allows faster response of your copter. This video shows it very clear. Note: I am not sure if the guy in the video has enabled the comp_pwm feature on the ESC with the SimonK 2014-09-30 firmware. On SimonK firmware the alternative of damped light is called “MOTOR_BRAKE” and can also be enabled. 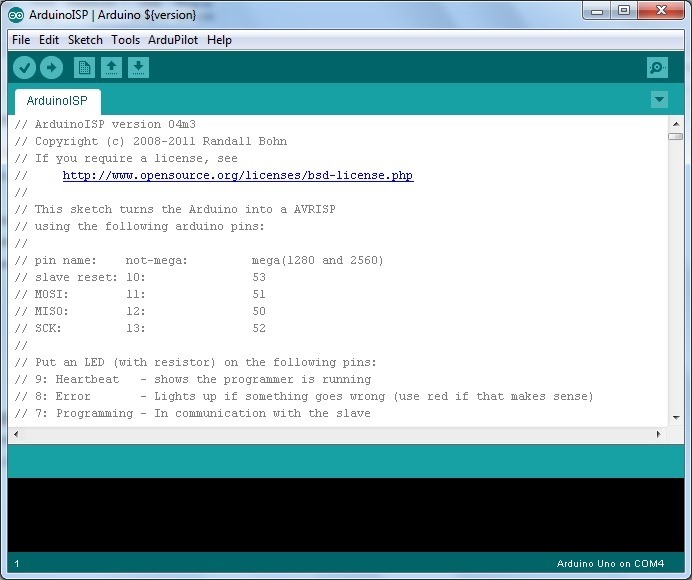 An ISP Programmer – USBasp AVR Programming Device for ATMEL; you can also use an Arduino as ISP device, but it is easier with the USBasp. 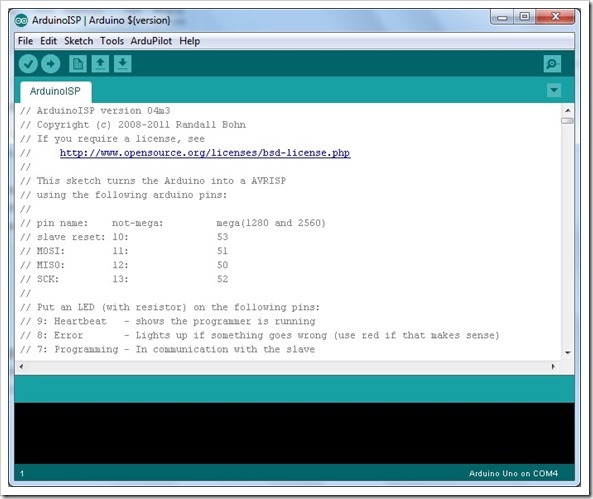 If you still want to use the Arduino check how to do it on this page. You will need to install the drivers for it too. 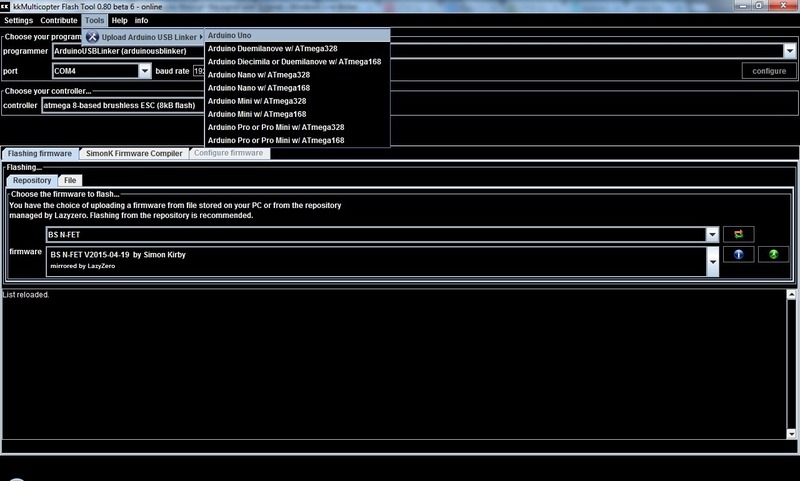 Atmel Atmega Socket Firmware Flashing Tool. 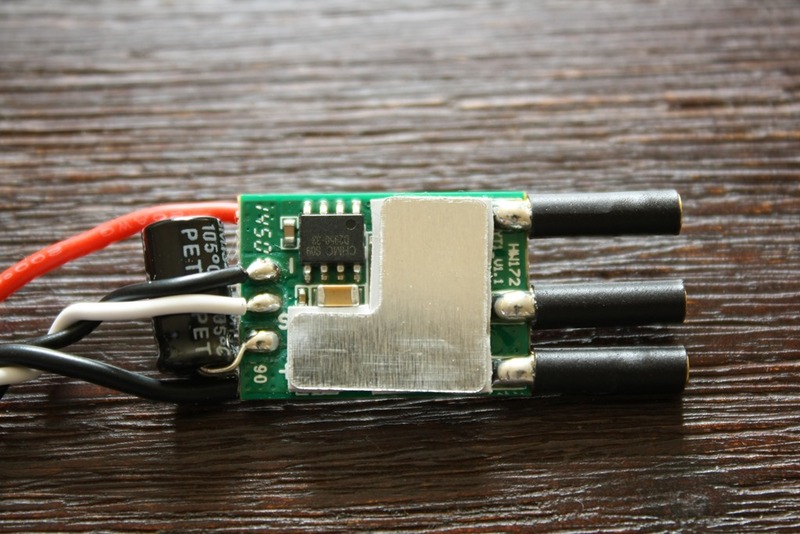 On some ESCs, that have pads on the PCB board you can even do it without this tool. I have done it once on my HK BlueSeries 30A, but it is much much easier with that tool. It is worth every penny and saved me so much time. There are several software applications you use to flash the firmware. I have always used the KKmulticopter Flash Tool. If you want to enable the comp_pwm function you will need the latest version 0.80 beta 6. I will show you how to do the flashing with the KKmulticopter Flash Tool. Plug the USBasp into your PCs USB-port. 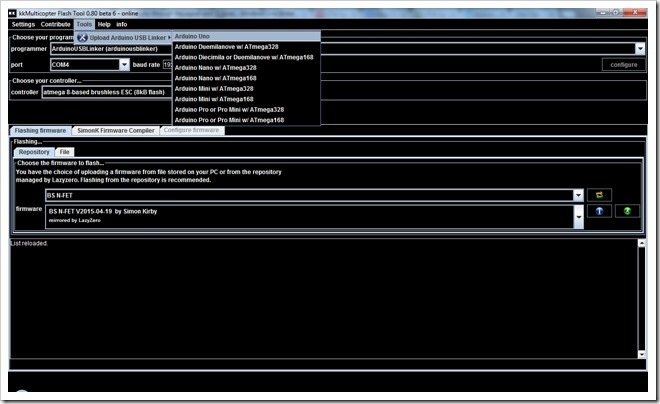 If you are using the Atmega Socket Firmware Flashing Tool connect it to the USBasp device. 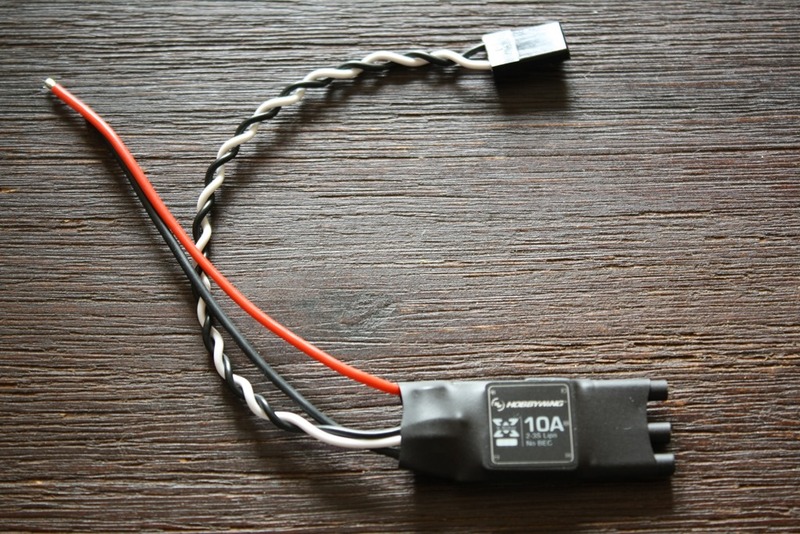 If you have decided to do it without the tool, connect the pins of your USBasp device with cables to the pads of your ESC (you need to identify the MISO, MOSI, GND, VCC, SCK and RESET pads on your ESC). Once everything is connected you need to supply power to the ESC. 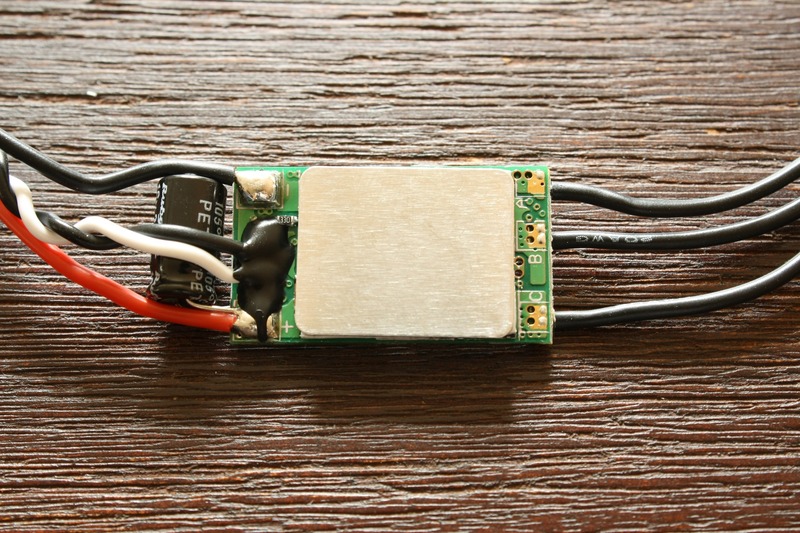 It is not recommended to use a LiPo battery as a external power supply, so do it on your own risk. Start the KKmulticopter Flash Tool. Choose the USBasp as a programmer. Then choose your ESC type. As said I will be flashing my HK BlueSeries 12a, which has an atmega8 (note: most of the ESCs on the market has this one or a Silabs-chip). Be sure to choose the one “+ enable Bootloader”, so you can later flash new firmware easily trough the servo-cable of the ESC. 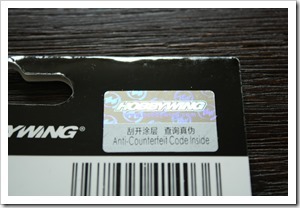 It is very important to flash the right firmware on the ESC or you can damage it. The list with the supported ESCs on top of this page tells you, which one is the right for you. 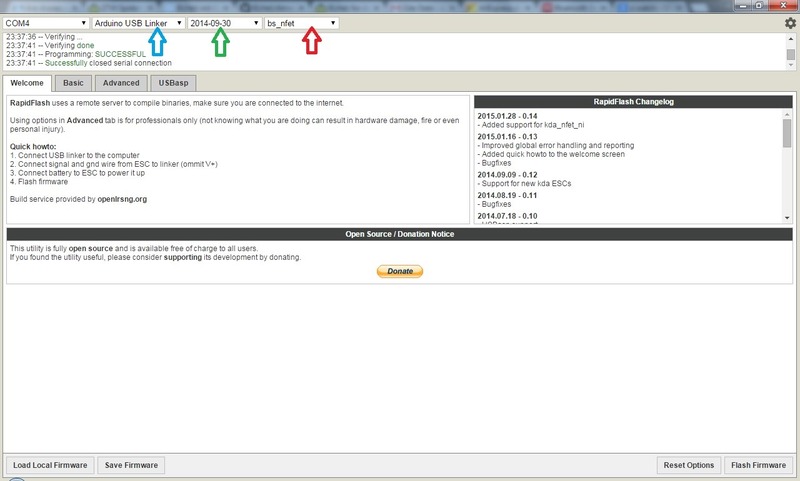 Last but not least you can define the firmware version. The latest one SimonK from 2015-04-19 support another useful function called “OneShot125”. 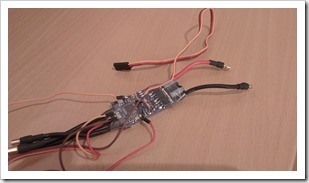 It is a modification on how the flight controller and the ESC communicate between each other. 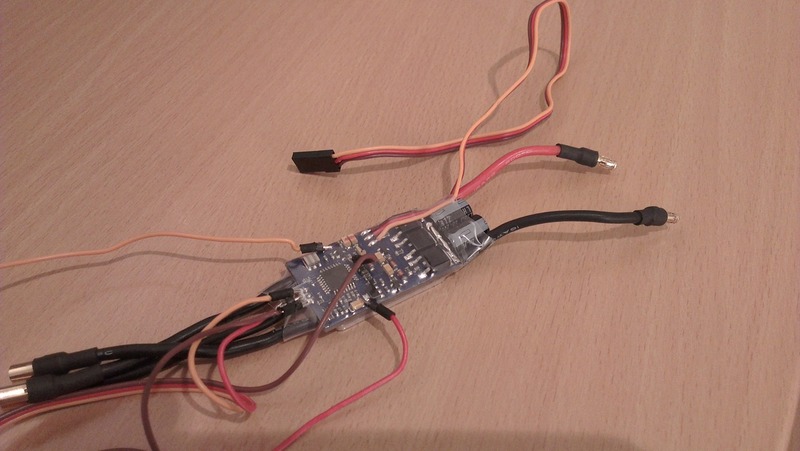 It should give us a more responsive system, but there could be issues with some ESCs and motors. If you don’t want to enable comp_pwm, you need only to click on the green button and the firmware will be flashed to the ESC. You should get the “Flashing of firmware was successful” message.